The Organization of American States (OAS) and the National Civil Registry of Colombia today signed an agreement that seeks to strengthen electoral processes in the country. The OAS Secretary General, Luis Almagro, recalled that the OAS trained electoral officials of the Registry two months ago in the tasks necessary to implement the electoral quality system. "We know that the organization of transparent and rigorous electoral processes is the main engine that drives the work of the Registrar, so from the General Secretariat we are committed to accompany them in this stage of implementation of a quality management system providing specialized advice and training," said Secretary General Almagro. For his part, the National Registrar of Colombia, Juan Carlos Galindo, recalled that the body he leads is autonomous and independent and has been organizing elections for 70 years. 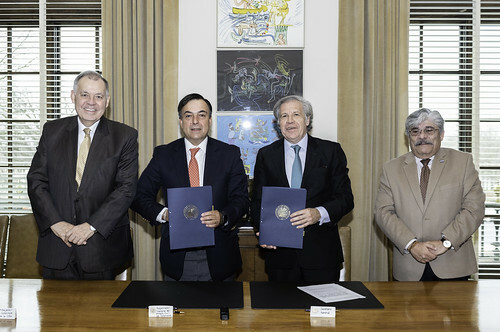 "Achieving this agreement with the OAS is a fundamental step to support us in that role that will allow additional peace of mind to Colombians, showing them how their electoral process are structured," said Galindo. The agreement seeks to strengthen electoral organization and logistics, and aims to obtain ISO 17582 certification. The ISO standards are established by the International Organization for Standardization (ISO), and are composed of standards and guides related to specific management systems and tools applicable in any type of organization.